LG Electronics will unveil a beer-brewing machine at Consumer Electronics Show 2019 in Las Vegas in January with the aim of leading the market in the widely popular home-brewing trend, the company said Tuesday. 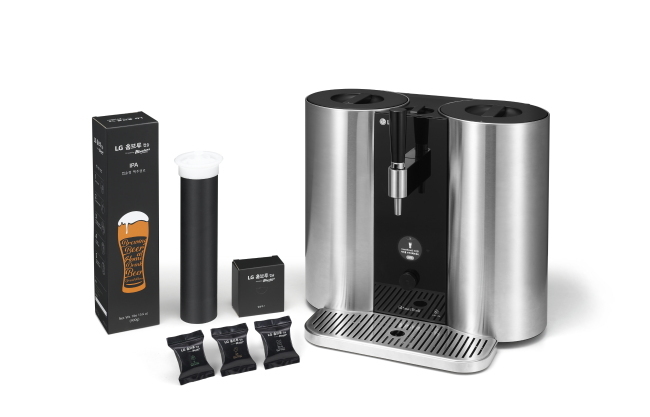 Dubbed “LG Home Brew,” the newest brewer is an automated beer-making machine, equipped with LG’s proprietary brewing technology supported by its inverter compressor and automatic temperature- and pressure-control technologies, the company said. The brewer works like an espresso machine. Users insert a malt capsule and water, and then press the main button. A single press will produce 5 liters of beer, which needs to be fermented for two to three weeks. LG partnered with Britain’s Muntons, a global malt manufacturer, to develop the capsules, it said. The brewer can make five types of beer -- pale ale, India pale ale, stout, wheat and pilsner. According to market researcher Grand View Research, the global market for home brewing is forecast to grow from $85 billion in 2015 to $502.9 billion by 2025. “LG will continue introducing unique home appliances that provide consumers with special and private experiences,” said Song Dae-hyun, president of the home appliances division at LG.